Despite Tropical Storm Erika, which hit in August 2015 causing intense flooding, 30 deaths, and US$480 million of damage, Dominica has remained attractive for foreign buyers. Sales transactions have remained steady. Most property sales were in the moderate price range of around US$200,000 to US$600,000, according to Safe Haven Real Estate. North Americans remain the top real estate investors, though there is increased interest from the U.K. and from Dominicans living overseas. Dominica's capital city, Roseau, remains one of the most popular locations for foreign investors, especially in the Castle Comfort and Wall House areas. There are no official records of house prices in Dominica. However, based on some property listings, two to three-bedroom houses can be bought for an average price of US$500,000, depending on the location, area, quality of construction materials and other factors. In Glasgow, Roseau, a three-bedroom oceanfront residence was listed for XC$650,000 (US$240,740). In Fortune, St. George, a two-storey house was priced at XC$750,000 (US$277,780). In Dublanc, a village in St. Peter parish on Dominica's west coast, a four-bedroom home was priced at XC$895,000 (US$331,480). In Eggleston, St. George, a three-bedroom luxury home has a selling price of XC$1.6 million (US$592,600). Despite the lack of direct international flights from the U.S., Canada or Europe, some foreign investors are enticed by Dominica's natural beauty and now by the introduction of the Citizenship by Investment Program (CIP), which is the most affordable in the world. Dominica's CIP allows foreign investors to acquire citizenship by purchasing approved real estate valued at a minimum of US$200,000. The property must be held for at least 3 years and may only be resold if owned for 5 years. Dual citizenship is allowed and there is no requirement to reside in Dominica before or after citizenship is granted. Much rebuilding and construction is currently taking place, after more than 370 private houses were destroyed by the storm. The economy contracted by 4.3% in 2015, after expanding by 3.9% in 2014 and 0.6% in 2013, and contractions of 1.3% in 2012 and 0.06% in 2011, according to the International Monetary Fund (IMF). The economy is expected to expand by 4.9% this year and by another 3.5% in 2017. 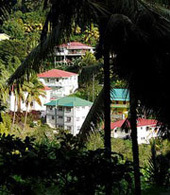 The government is quite lenient to foreigners purchasing property in Dominica. Non-residents can acquire property up to one acre (4,046 sq. m) for residential purposes, and up to three acres (12,140 sq. m) for commercial use. Only those who plan to buy more need to obtain an Alien Landholding License. Gross rental income returns (yields) are around 4% to 5% for properties located in Dominica’s coastal areas, in some cases it can reach up to 6.7%. Rents in the islands are predominantly seasonal but these yields figures are for long-term rentals. Rentals have not risen during the last five years, save around Picard. A two bedroom property rents for about US$800. Some higher end rentals have dropped as the offshore industry has declined. Rental Income: Rental income earned by nonresidents is taxed at progressive rates, from 15% to 35%. VAT is also levied at rental income at a flat rate of 15% but a special rate of 10% can apply under certain conditions. Capital Gains: There are no taxes on capital gains. Inheritance: There are no inheritance taxes in Dominica. Residents: Residents are taxed on worldwide income at progressive rates, from 18% to 35%. Total roundtrip transaction costs, i.e., the cost of buying and selling a property, are at 28.45% of the property value. The Alien Land Holding License fee is 10% of the land's market value. The buyer pays legal fees (3% + 15% VAT), judicial fees (2.5%), and the assurance fund (1%). The seller usually pays the agent's commission of 5%. The buyer pays 4% stamp duty, while the seller pays 2.5% stamp duty. Rent: The rent can be freely agreed, except when less than US$300 a month, where the highly pro-tenant Tenancies and Rent Control Act applies. Tenant Security: The recovery of premises from an unsatisfactory tenant must go to the High Court, and this can take time. But a tenant who thinks he has no defense to a claim for possession would normally vacate upon commencement of proceedings. To do otherwise is to bear unnecessary legal costs. Dominica (pop 71,000, GDP per capita US$7,030 in 2015) lives up to its name as the “Nature Island of the Caribbean.” It is the youngest of the Caribbean islands, and there truly is a lot to explore. A haven for nature lovers; its mountainous terrains proliferate with virgin forests, natural springs, and a multitude of rivers cascading down steep cliffs to meet the coast. Moreover, it is one of the world’s premier diving spots, its surrounding reefs emanate from the Island’s volcanic origins. Highly dependent on agriculture, Dominica's economy remains very vulnerable to climatic conditions and to international economic developments. The economy grew by an average of 2.9% per year from 2000 to 2010. The economy contracted by 4.3% in 2015, after expanding by 3.9% in 2014 and 0.6% in 2013, and contractions of 1.3% in 2012 and 0.06% in 2011, due to the adverse impact of Tropical Storm Erika, according to the International Monetary Fund (IMF). The economy is expected to expand by 4.9% this year and by another 3.5% in 2017. Dominica’s tourism industry has blossomed, despite the lack of direct flights. Businesses like bars, restaurants, and hotels are happy, and locals look forward to seeing and hearing about the big “Pirates” celebrities like Johnny Depp, Keira Knightley, and Orlando Bloom. In 2015, due to tropical strom Erika, tourist arrivals dropped 5.3% to 358,820 persons from the previous year, after more than an 18% surge in 2014. In Q1 2016, total visitor arrivals increased 3.3% to 184,724 persons from the same period last year. Stay-over visitors rose by 5% from a year ago, at 24,933 persons, while cruise ship passengers increased 3% to 153,093 persons. Most tourists come from other Caribbean states, the United States, the United Kingdom, and Canada.